The award-winning open-air jeep tour company uses Dropbox Business to collaborate on everything from organising group tours to paying the bills. 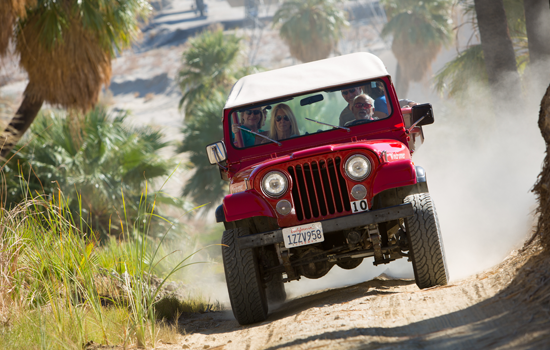 For nearly 30 years, Desert Adventures’ iconic red jeeps have shuttled visitors around Greater Palm Springs, introducing them to the flora and fauna of the vast Colorado-Sonoran Desert. As Palm Springs has become a hotspot again on both the weather and travel map, demand for the outdoor adventure company’s eco tours has boomed. While great for business, the surge in clients – up to 10,000 people a year – was testing the 35-employee company’s ability to keep growing. “When we had to update sales documents, we were just emailing each other and everybody was saving copies” says Kimberly Nilsson, Desert Adventures’ Owner/ Operator. “But of course, everyone was working with different copies and there were all kinds of conflicts”. The challenge was magnified by the fact that the small business’s office is virtual: Nilsson’s business partner Bob Schneider manages operations on site in Palm Desert, but Nilsson is based in Santa Barbara. The group sales rep, who happens to be Nilsson’s mum, lives in Hawaii. To make it easier for her team to work together, Nilsson decided to open personal Dropbox accounts. “It’s hard to share all of our files and materials with each other when you’ve got people in all of these different locations” says Nilsson. “Having Dropbox was essential for us”. Nilsson decided to upgrade to Dropbox Business after learning about features such as unlimited version history, which makes it easy to recover accidentally deleted files or revert to earlier versions. “I thought that was really intriguing because every now and then, you delete a file by mistake and it’s like, ‘Oops, what did I do?’” says Nilsson. “So at that point, we switched to the Business account, and we were really happy we did”. Desert Adventures now use Dropbox Business across the business, as the solution backs up files automatically and allows employees to access them from anywhere. “My policy is that nothing gets stored locally” says Nilsson. “Everything lives in Dropbox”. The group sales manager uploads correspondence, proposals and contracts for each client into a folder that she shares with the rest of the company. This saves employees from having to email or call her to find out the status of the sale. “Anybody who needs to know what’s going on with that group can get immediate access to it” says Nilsson. Clients looking for more info on tours receive shared links to marketing folders containing pictures, videos and other information. “It’s a lot better than trying to send high-res photos over email, which never works” she says. “I can just send them the link to the folder for the San Andreas Fault tour and say ‘Here are 20 photos’”. And every new invoice sent to the Palm Desert office gets scanned and uploaded into the accounts payable folder. “Now I’ve got a copy that I can use to pay bills from Santa Barbara” Nilsson says. The Dropbox mobile app comes in handy when employees are on the road and get enquiries about tours. “If a client calls, we can find the sales document they need and just email them a link from our phone” says Nilsson. “That way, there’s no delay getting back to our clients”. Running on Dropbox Business, says Nilsson, allows Desert Adventures to focus on providing award-winning tours to places like Joshua Tree National Park and Palms Springs Indian Canyons. “I wear a lot of hats and I’m not an IT professional” says Nilsson, “so setting up a secure server and things like that – I wouldn’t have a clue. This saves us from having to pay somebody else to do it or to hire another employee.” For a small business like Desert Adventures, the fact that Dropbox Business works across platforms and devices means the company doesn’t have to standardise on one environment. Nilsson runs her office on Windows, but employees often access Dropbox folders using their iPads and iPhones. “The ability to have everything you need at your fingertips is a game-changer” says Nilsson. “Dropbox is a huge time-saver and, when you’re running a small business, time is everything”.